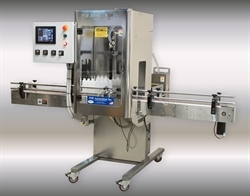 The PSR Automation Inc. F1000 Filler is a versatile machine. Fill from 2 oz to 1-gallon bottles without any change parts, and perform changeovers in under 15 minutes with the Quick Changeover System (QCS). The F1000 can increase your output by saving on changeover times and improving fill rates. 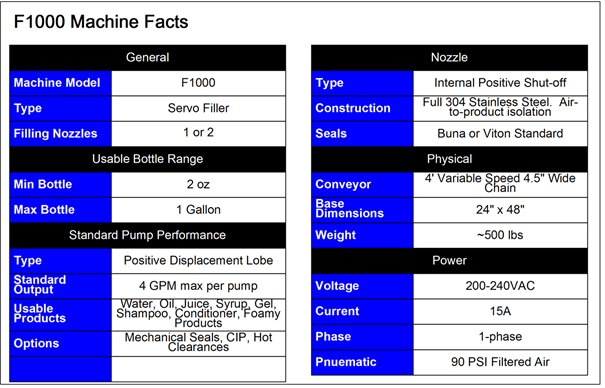 The F1000 is available with 1 or 2 Filling Nozzles. - Standard with (1) Filling Nozzle. Upgradeable to (2) Filling Nozzles. - Servo Diving Nozzle Bar. Rise rate is automatically coordinated to Product Pump rotation. - Independent Servo controlled pump. - Fills products up to 1 gallon. - 15 minute changeover with “quick-change” pumps. - Primarily stainless steel and aluminum construction. - Stainless steel tubular frame. - 4' stainless steel Conveyor with variable speed drive motor. - Dual Indexers with stainless steel and aluminum construction. - Stainless steel (contact parts) Lobe Pump. - Standard 1.5" ports with Tri-clamp connections. - Pump meters product based on values entered on the Touchscreen. - Servo Motor operation allows for product acceleration and deceleration. - Internal Positive Shut-off Nozzle prevents product drips. - Fully constructed of stainless steel. - Isolated Pneumatic-to-Product supply prevents product contamination. - Standard Nozzle size is 9/16" diameter. Available in sizes up to 7/8" diameter.